Lissa stood at the kitchen door and watched Charlie as he sprinted around the yard. He was a funny little dog…a purebred Pekingese with the personality of a St. Bernard. “COYOTE!” she screamed spilling her coffee. She wrenched the door open and frantically called for Charlie who was racing toward the beast, fearlessly determined to defend and protect the property. The coyote stood at the edge of their brush just watching Charlie advance; his speed was surprising given his short legs. Charlie suddenly stopped running as if he had come to his senses and realized that danger was ahead of him. He did a little jog in a circle and barked in short spurts. The coyote just stared as if daring Charlie to continue his charge. Finally, Lissa managed to get Charlie’s attention and he started to head back to the house. 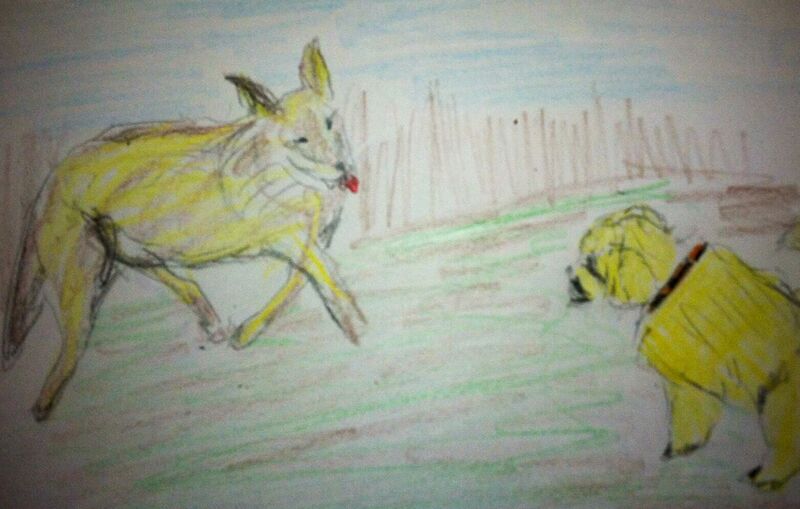 Once inside, Lissa watched the coyote slowly saunter toward the neighbor’s field and disappear into the brush.